Sweet ending to your reception dinner—CAKE!!! The OBX may be floating out in the ocean, so-to-speak, but the options for your cake style, flavor, etc., are as boundless as those in the city! 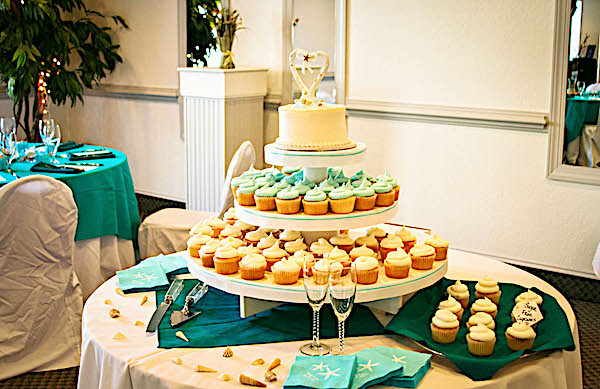 Since we’re next to the beach, you tend to see many themed cakes….white-chocolate hand-crafted shells, beach chairs, beach-fence and grasses…even sea-glass inspired sugars are used for decorations on many wedding cakes. 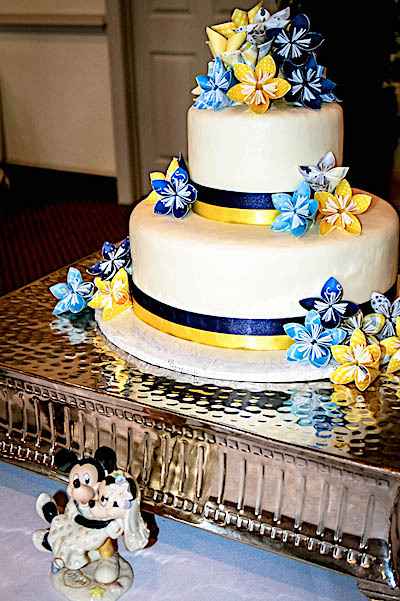 But, you can also tie in your color-scheme, either with flowers (fresh or sugar), ribbons, piping, etc. 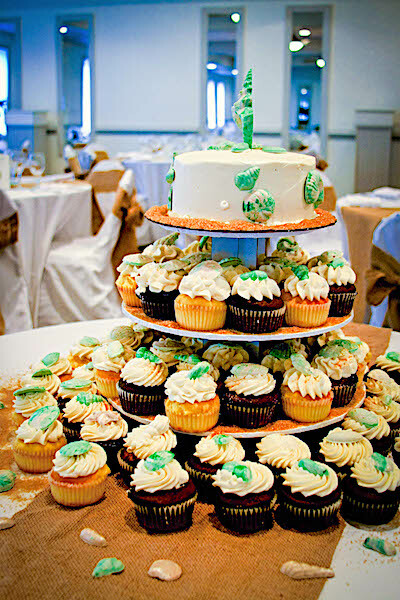 And a recent trend that seems to have ‘stuck’ is using cupcakes in addition to the ‘anniversary layer’, or the smaller cake that the couple cut during the receptions; this way, the flavor combinations can be numerous, sure to please everyone’s tastes. Chocolate,custard-filled, fruits, your cake can reflect your personal favorites. 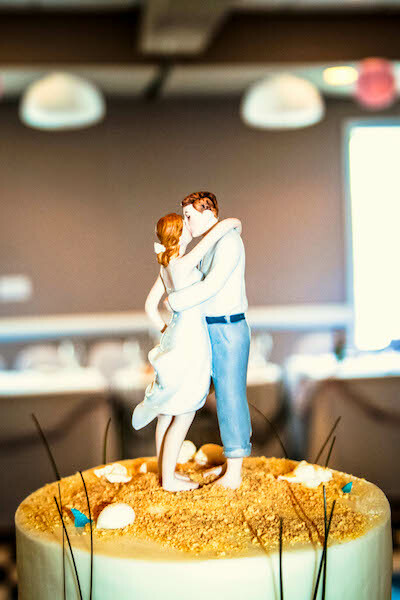 Cake Topper choices can be fun too—favorite sports teams, cartoons, or hobbies and activities can represent the couple….or something as simple and classic as initials can be the focus of the cake. 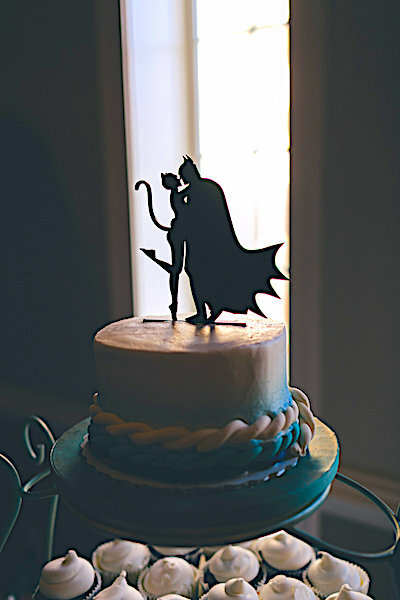 Let your imagination run away….chase it down….put it on the cake!! 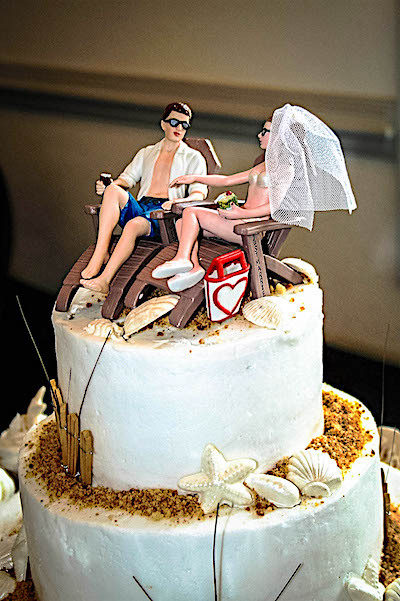 This happy couple catches a few rays on their wedding cake. Yes, Cupcakes and Cakes go together perfectly! The Sea Ranch Resort is a full service wedding facility and venue on the Outer Banks of North Carolina. We feature Oceanfront Accommodations for your group or wedding party. Located in Kill Devil Hills we have beach front dining and our staff is on hand to make your Outer Banks Wedding an unforgettable experience!